With getting to 20 wins already and having 6 games still remaining on the regular season schedule… Texas Tech is eyeing a solid seeding in March Madness for a second straight year. Get use to it, because this is when all the basketball schools start eyeing that NCAA postseason positioning. There is a lot of basketball to be played including a conference tournament. Yet, traditional basketball powerhouses do not ponder if they will make the Big Dance or not. They worry about closing out the season strong to chase a conference title and bolster their NCAA Tournament seeding. Welp ladies and gentleman, that is currently where we are as a basketball program at Texas Tech. No worried bubble talk here, it is such a great feeling. 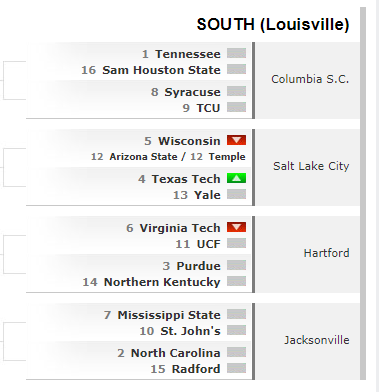 Joe Lunardi the most notable bracketologist in the group has the Red Raiders starting out in Salt Lake City against Yale as a #4 seed. It seems like a reasonable spot, and the winner would get to likely square up against Wisconsin next in this scenario. The Badgers are not as scary as they had been in previous years, but that is one tough match-up for a second round game. 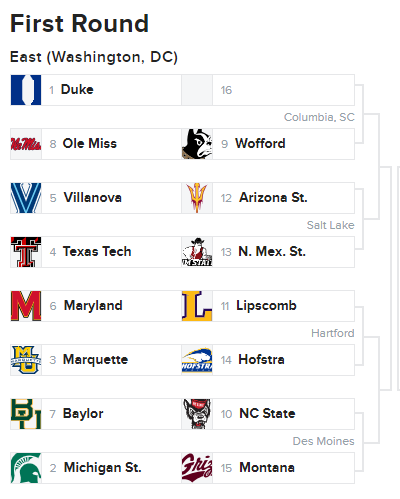 Per CBS College Hoops expert Jerry Palm, Tech would get New Mexico State in Salt Lake City… I’m going to call out an error here and let you know that CBS screwed up and put Salt Lake City, the game should be in Jacksonville for the East bracket. The second round in this scenario would be Villanova. How satisfying of a game would that be to watch the Red Raiders get a chance to knock Nova out after what happened last year? Our buddy Erik Haslam over at Haslametrics places Tech in the highest seating as a #4 seed. This is consistent with what the bracketologist’s are thinking in their seeding predictions. 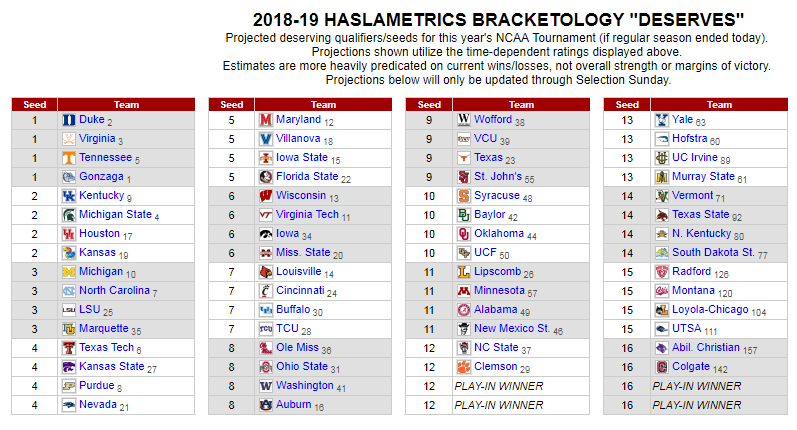 Note that Kansas is a #2 seed, that game in Lubbock is going to have major implications on all these seeding forecasts. 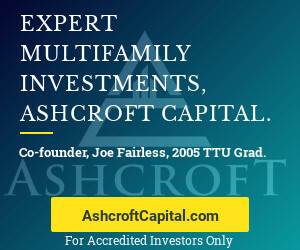 One of my favorite metrics websites is TeamRankings.com, and they have Texas Tech as the most probably #5 seed at 20.8%. 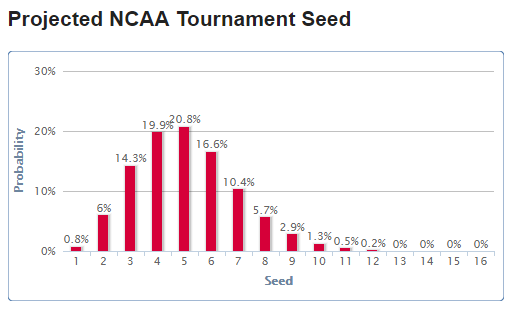 Though the #4 seed probability is very close at 19.9%. The conclusion here is that our Red Raiders can move up or down from this point on with how they do moving forward. If we go off the rails we could look at a much lower seeding position. On the other hand if we take care of business, and win most of the remaining games with an added quality victory over KU in Lubbock our stock would rise. Anything can happen, and these are just predictions for where we stand at the current time. Yet, like I stated above… it is a great feeling to be here instead of scratching our heads and wondering IF we are even going to make the postseason this year. Cherish it, this is a special place to be for a college basketball program. Wreck ’em Tech!! !